This is the first part of a post which will guide you through the entire process of writing and self publishing a book for the first time. It’s about my book called Mastering Vim Quickly: From WTF to OMG in no time. Vim is a very powerful text editor, used mainly by sysadmins, software developers and similar IT people. It’s known by its steep learning curve, because it’s different than majority of all editors. So sometimes in 2014, I wanted to improve my Vim skills. I was already a Vim user for more than a couple of years, but I knew there’s much more I can learn. I did a quick research on the best books on Vim, and I’ve bought a few. Soon enough, I was pretty disappointed. All of these books had too much information which I didn’t really need or want to know. They were also way too long. I really didn’t have the wish or time to spend reading a 300 page book, just to learn some new Vim features and concepts. About that time I came up with idea to write my own book – a book from which I would like to learn Vim. It should be a short read, not more than 150 pages. It should contain the most important Vim concepts, and only the most important features. If you never used Vim, you should know that this is very important, because Vim has really a lot of features. And you can never stop learning it. I wrote a few blog posts about the idea for the book. I also left a small sign up form below these posts, for people to sign up for the updates, in case they were interested in the book. I also wrote a very simple Twitter bot, which would read RSS feeds of some blogs and websites writing often on Vim, and from time to time tweet out those posts with the original links, of course. So all it was really doing was sharing the Vim links consistently. I did follow a couple of hundred Vim users on Twitter as well, and I let the little script to run on my VPS. I just moved to Berlin, Germany. I had a few job offers, and I was about to join one startup. Those days, I finally decided to realize my idea – write a book on Vim. However, unexpectedly things went wrong with my work permit. Long story short: My homeland is not part of the European Union. The only way to get a work permit was – I had to have a university degree recognized in Germany. Now, I did have the Bachelor university degree. But, it wasn’t recognized in Germany. That’s why, I couldn’t get any job in Germany. I had to come back to Serbia. Obviously, I had to completely cancel all the work on Mastering Vim Quickly. I closed my freelancing business. I’ve fired all the clients. And I had to go back to university again. I spent a whole year on completing my Master degree in Computer Science. The one which is recognized in Germany. It took a lot of hard work, but I did it! I got back to Berlin. It was a long way. It took a lot of time and effort, but it was worth of it. I’ve found a dream job in an awesome startup. I got back to Berlin, ready to start with new job. The previous year was very though. My whole life, for most of the days, was dedicated to getting that Master degree. I already kinda gave up from writing a book on Vim. I already had different ideas and priorities, and my motivation wasn’t as high as before. However, I remembered and decided to check what’s going on with my bot and old Twitter account. I totally forgot about these. I finally had some time to clean up my VPS and remove this bot and some other obsolete stuff. To my great surprise, I discovered that my Twitter account @MasteringVim had around 4000 followers! How the hell that happened? Turns out, bot was tweeting regularly. Most of the tweets were Vim articles from other websites. From time to time, it would tweet my few of my articles about the idea for the book “Mastering Vim Quickly”. Lots of these Vim articles were good. Some of them were tweeted more than a few times. Sometimes, articles would be crappy. But, the it seems like the consistency was the magic trick. A small group of about a hundred followers I had (before I left Berlin) started to retweet those, and bit by bit, my account started to reach bigger audience. About a year after, 4K followers, Wow! I quickly checked my free Mailchimp account (after more than a year!) to see if anyone actually signed up for the updates on my book. You can guess – there was much more people that I expected – around 400 of them! Crap. Now I felt responsible to at least inform the subscribers why they didn’t hear a word from me for more than a year. I went through the list of emails. There were people I knew, and people I “knew” from some online communities. Still, the majority were total strangers. So after a bit of thinking, I’ve decided – I’ll write them an email. I’ll tell them what happened in my private life. I’ll inform them that I didn’t even start writing Mastering Vim Quickly. And I thought, for sure most of them won’t be interested in the book after a year. Some marketing gooroos told me that email list which you don’t contact often is “cold” and pretty much non-responsive. Here’s what I had in mind: I’ll write them the truth, there’s no book yet. They’ll get disappointed, or they’ll unsubscribe and/or send hate emails – because they won’t even remember me and my idea. That will let me give up of writing the book without guilty conscience that I let anyone down. Something totally unexpected happened. I’ve sent that email, as planned. What happened is that I got a bunch of email replies, congratulating me on my persistence to get the CS degree and get back to Germany. Many of these subscribers were still interested in the book, and more than a few already wanted to pre-order it, and asked me how to pay for it! WOW! I had no choice really. Giving up now would be pretty bad. I knew many of these people, and they were expecting on me to deliver what I promised – a great book on Vim. So that’s how I decided again, I’m going to write Mastering Vim Quickly! The first thing I did was to stop the Twitter bot. That time I started tweeting personally, and I still do today. 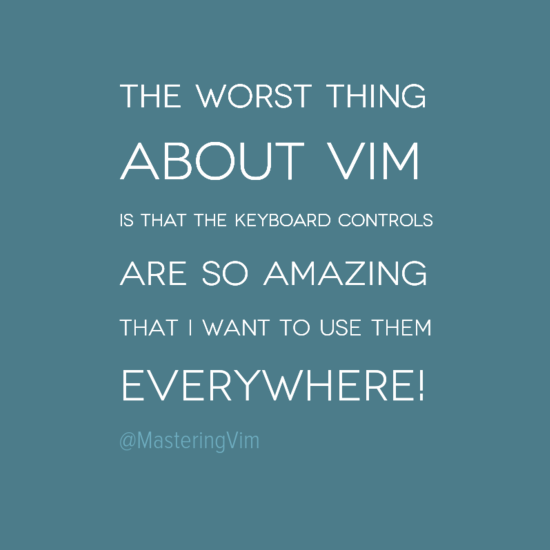 Via @MasteringVim I share the best tips on Vim. It currently has around 20K followers. While I was writing the book, few things happened, which I would never expect. First, I’ve got contacted to cooperate with one big publishing house. We tried talking, but we had different visions, so no cooperation happened. Lastly, I got invited to a conference to talk about Vim – and my book wasn’t even written yet. I had to say no, and focus on the actual writing. In the next post (part 2 of this story) I’ll share my experience on the writing process itself, the book “launch” and the process of publishing a paperback on Amazon. If for some crazy reason you’re not already a user of Vim, shutdown your computer and go think about your life choices. Joking aside, Vim is really a great editor. And if you didn’t know – Vim supports macros. This is probably the most underused Vim feature which can improve your productivity dramatically. You can do all sorts of amazing stuff with your code using macros. Then, using command @a I run the macro on the current line. After that, I can just hit @@ to run the macro I previously run. Using macros can be even more effective with recursion. Recursive macros are especially useful when you need to act on many lines in a file. In order to record a recursive macro, you need to start with an empty register. You can make the register a empty by hitting qaq. @a – this is the key step: while recording a macro in register a, we call it inside itself! There’s so much more you can do with macros in Vim! You can master this magic too! Get Macros chapter (plus three other!) from my book Mastering Vim Quickly for free. Get 4 chapters for Free! I believe you have already heard of the principle Don’t Repeat Yourself. In software engineering, this is a principle of software development where your focus is on reducing repetition of all kinds. As you’ll see throughout the book, Vim has many ways and commands to automate different kinds of tasks, so you don’t have to repeat your actions. One of the most powerful Vim command when it comes to avoiding repetition is the . (“the dot”) command. Hitting . in Normal mode will repeat the last native Vim command you’ve executed. Let’s say you want to delete 5 words from the cursor forward. As you already know, you could press 5dw and it’s done. However, sometimes it’s not convenient to mentally count the number of words. An alternative would be to use dw to delete one word. And then press .... to call the dot command four times. In this case, you would repeat the latest, dw command, four more times, and in this way achieve the same effect without counting the words. If you used dd to delete a line, and you want to delete 4 more lines, you could also execute 4. instead of pressing .... . That also works. and your cursor is positioned on the first line. You want to append ; to all three lines. • A – would place your cursor at the end of the first line in Insert mode. • ; – you press to actually insert it, and then you press Esc to get back to Normal mode. Your cursor will still be at the second line rather than on the third line, but ; will be appended. This brings us to conclusion that only this part of our original command was repeated: A;<Esc>. Now, why is this the case? It’s important to remember that with the dot command, you can repeat the commands which change the contents of the buffer. A change is any command which you can use to modify your text. In our example, we had the case that command j wasn’t repeated, and our cursor wasn’t moved to the third line. Commands like j are called motions (or nouns)—and they don’t affect the text itself. Command j just moves the cursor, but doesn’t change text anyhow, so it can’t be repeated. Think in terms of the grammar of your native language: Not nouns, but verbs are used to express some sort of action. The same is true in Vim: nouns (or motions) can’t affect the text, so they can’t be repeated with the dot command. As you already saw in the chapter on Undo/redo, Vim is pretty powerful when it comes to these features. However, there’s one more feature which I didn’t mention, as it takes a bit of configuration. In Vim, like in every other text editor, you can perform undo/redo in your current session. Once the session is closed, and you reopen the same file, running undo will do nothing – as you will be already at the oldest change. Vim supports persistent undo, which means that you can run undo/redo even from your previous sessions. This is great feature indeed. This way you can go back historically through changes of any of your files. However, Vim will write undo history files in the same directory as the file you edit. Overtime, this will become messy. You don’t want that. That’s why, I recommend you complete the next two steps as well. My assumption is that ~/.vim is your Vim directory, where your .vimrc, among others, is located. That’s all. Vim will store all the undo history files in that directory, and you’ll have persistent undo working flawlessly. 1. WTF is going on here? 2. Hmm… this is cool. I want to see other interesting features this thing has. That’s why I wrote a book: Mastering Vim Quickly (from WTF to OMG in no time) which will teach you Vim the way I learned it – easily and quickly.